When the Marx Brothers got into the film business in 1929, their first film was made from their second show, The Cocoanuts. Their third show Animal Crackers became their second film in 1930 but why wasn't I'll Say She Is produced as a film? "Well", Groucho said, "Cocoanuts" had a story. "I'll Say She Is" was a series of funny scenes.". In July 1999, ScotJohn96 reported on alt.comedy.marx-bros that First National negotiated with the Marxes in 1926 to make a motion picture. 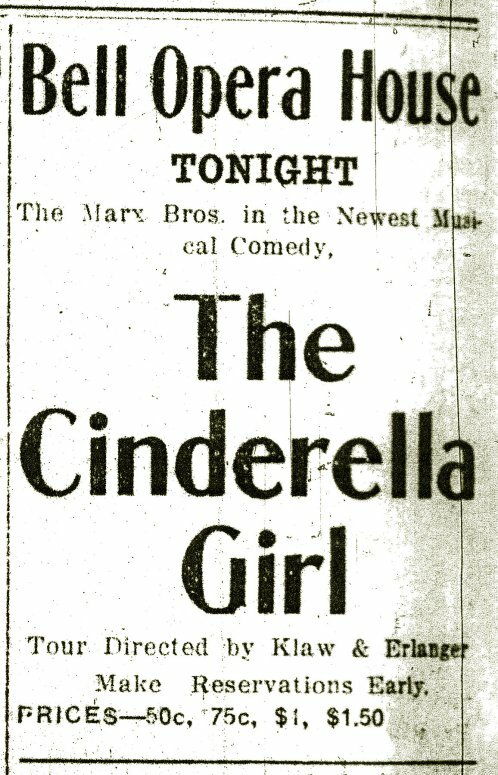 "Variety" March 24, 1926 said: "The story has been written by Will B. Johnstone...author of 'I'll Say She Is'...."
The Marx film would have been silent, as First National was not making talkies at that time. Will B. Johnstone Junior has said that his dad was hired as writer on the adaption of I'll Say She Is for a Marx Brothers movie but that he quit after a couple of weeks when he found out that they only wanted his name on the screen credit. This may indicate that the abandoned project in 1926 actually was an attempt to film I'll Say She Is. Another possibility is that the Marxes were willing to return to the first Broadway-show in 1931 after filming The Cocoanuts and Animal Crackers, a theory that may explain why they revived Napoleon's First Waterloo for stage appearances in 1930 and used Theatrical Agency from the show as a trailer for the film that became Monkey Business. I've been toying with the idea of reconstructing a film and these are my thoughts. Just like the original show, it has to be a compilation from different sources and technically it has to be in the vein of Dead Men Don't Wear Plaid and Forrest Gump with archive material being completed by newly filmed sections. The most obvious material with the Marx Brothers are of course the promotional version of Theatrical Agency and the animated Napoleon's First Waterloo. Another valuable scene if it still exists would be the Introducing J. Cheever Loophole-scene from At The Circus in the place of the The Court Room. The film starts with some contemporary New York-footage, complete with ads for the try-out at Mr Lee's Theatrical Agency. Maurice Chevalier's recording of You Brought a New Kind of Love to Me may accompany this, both to make us familiar with that song and also as a link to the Theatrical Agency.The existing scene with Mr Lee (Richman) and the Marx Brothers (Groucho as Lawyer, Harpo as Beggarman, Chico as Poorman and Zeppo as Merchant) may be completed with new material introducing Thief (Before...), Doctor (...and After) and Chief. As Richman will be essential for the film as a guiding character, the existing scene with him and the Marxes need to be re-shot by a new actor. Most of the action with Richman, Thief, Doctor and Chief is described in Theatrical Agency, version 2. A possibility is to use the added Agency-material with them as the introduction and let the Marx Brothers follow. The scene ends with the eight men walking away singing Hoagy Carmichael's Doctor, Lawyer, Indian Chief. This song may be combined with Love Is Sweeping The Country by the Gershwin Brothers, a song that mentions Richman, Poorman, Thief, Doctor, Lawyer and Chief from the original rhyme. The next scene is Beauty's Reception Room, more or less as scripted. I'm imagining the interior of Beauty's house to be very art deco, just like the interiors shown in Animal Crackers and Duck Soup. Naturally, the Marxes will have rather small parts, represented by glimpses from different films of them standing by and listening (if not doubles are used). A possibility is to use cut scenes from films (IF they still exist!) such as the "Bellhops"-scene from A Day At The Races and the excised parts of the "College Widow"-scene from Horse Feathers. These films also have the writer Will B. Johnstone in common with I'll Say She Is. It would also be great if the sequence with Groucho singing A Little Bungalow from The Cocoanuts exists somewhere, as this could be his lovesong to Beauty. I'd like The Inception of Drapery to follow, making Merchant (Zeppo) the first one to meet Beauty on his own. Most of Zeppo's entrance from "Theatrical Agency" ("My name is Sammy Brown...") could be re-used, thus letting him enter the Beauty's Reception Room with modern film-editing. Zeppo will be the most suitable Merchant, having worked "in a department store" before. Most of the scene with Merchant providing Beauty with an international wardrobe ("Perfume from Hindustan", "Silks from Japan" and so on) should be possible to recreate, although Zeppo have to remain rather silent. A performance of him singing You Brought A New Kind Of Love To Me may be pieced together though from the fragments in Theatrical Agency and Monkey Business (where Zeppo starts to sing the song on two occasions). If Beauty sings the missing lines it would even be a nice duet! "Furs from Russia" may include the "Blue Tartar" while "Fan from Timbuctoo" gives an opportunity to use cut scenes from A Night In Casablanca (Yellow Camel Taxi Service and Desert View Motel) or even footage of Gallagher and Shean singing Mr Gallagher and Mr Shean ("All up and down the Nile, the girls wear nothing but a smile, That's why I'm here, Mr. Gallagher! That's why I'm here, Mr. Shean!"). After this, Beauty will follow Richman to Wall Street, again more or less as scripted. The futuristic design in black and white should be interesting to recreate, including the giant tickertape machine, the tragedy of gambling, the golden discus player ("The Greed of Gold") and the Silver Ballet. The fairy in the tickertape machine could be an animated Groucho (in the vein of Genie in Disney's Aladdin) as the pipe-smoking Fairy Godmother (which automatically leads to Cinderella Backwards). Chico in Australia 1948 A climactic scene in the play took place in Chinatown but as the "opium den" is impossible to use today, let's concentrate on Thief's claim to give Beauty "the thrill of the underworld". I suggest this could be represented by an illegal night-club, which can be the playground for several activities. First of all, in order to enter the club it gives us an opportunity to re-use the "password"-scene from Horse Feathers, thus creating a small scene with Beauty and Poorman (Chico). The musical entertainment in the club may include a cut from the 1944-film Atlantic City with Joe Frisco singing Darktown Strutters' Ball (a reference to the original Theatrical Agency) and maybe even a filmclip with The Six Brown Brothers. Among the thrills shown in the script, there's also room for musical numbers with Chico and Harpo. 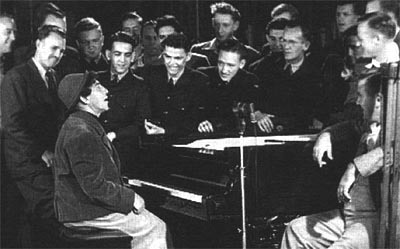 Maybe a number with the Chico Marx Orchestra (if they were ever caught on film), otherwise a cut from Chico's visit in Australia 1948 where he played Waltzing Matilda with several soldiers standing around the piano. The entire segment with Harpo from Stage Door Canteen (1943), could be edited to include Beauty and thus become their encounter. The military audience in this cut fits with Chico's appearance down-under while Harpo's performance of Stardust makes a nice link to Doctor, Lawyer, Indian Chief, as both songs are composed by Hoagy Carmichael. Beauty's visit in the underworld should somehow lead up to her arrest. Nobody has to be murdered, it's enough to have a police raid at the illegal nightclub. This leads to the Court Room-scene and Beauty's encounter with Lawyer (Groucho). A vital ingredient should be the cut scene Introducing J. Cheever Loophole from At The Circus, but even without this I think it should be able to piece something together from various radioshows and filmclips, mainly the court room scene in Duck Soup. The scene may end with Groucho singing Go West, Young Man from Copacabana, a song with lyrics that refer to both judges and travels around the world. After the trial, the disillusioned Beauty sits by the Marble Fountain in her cold, frozen "Russian Garden". In a reversed version of Pygmalion and Galathea, the male statue comes alive! It's the Indian Chief, who comforts Beauty. Around them the other seven men, "The Tramp Ballet", are dancing (with the Marxes being cut from other films). Chief sings "Only You" and it would be great if the scene with Harpo pulling himself with a rope from "NBC Colgate Comedy Hour" (a TV appearance with Donald O'Connor in 11 November of 1951) still exists, as a similar stunt was used in this scene in the original play. It may also be possible to recreate the scene with a look-alike. Still by the Marble Fountain, Beauty is left with Doctor, "a mysterious man"; "Look, I have the hypnotic eye, I make them sleep, I make them sigh, I make them wake, I make them cry, For I am a hypnotist!". Most of the dialogue from the script can be used with Doctor as The Hypnotist and Beauty as "the straight man". Maybe Doctor could sing that he's Dr Hackenbush (although THAT doesn't feel right at all!) but that would at least make Groucho's singing response "If that's the case, I'll go" very appropriate. The scene leads up to Beauty being hypnotized, taken centuries and centuries back, believing she is "Josephine, wife of Napoleon Bonaparte, Empress of the World". This allows the animated Napoleon-scene to appear as a hypnotic dream. After this, the contest and the film has reached its end as scripted in The Finale. The final song may be The Musketeers, accompanied by footage edited together like a rock video, mainly with the Marxes in uniform from Duck Soup.